Learn how the global leader in virtualization solutions used Social Business Software to connect with prospects, customers, experts, and partners to expand their audience from 15,000 to 50,000. 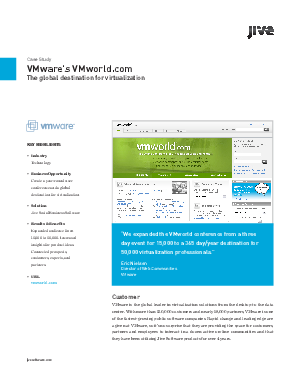 Originally launched as an extension of their popular VMworld conference, as VMworld.com approaches its one year anniversary it has established itself as the largest virtualization community in the world. VMware can now see in real time the hot areas in the virtualization community, the trends and top of mind concerns, and leverage these insights in product direction and messaging. By extending the user conference to a year-round event, additional revenue was generated through on-line access to conference content and through virtual partner pavilions. The cost of event management was also reduced through automation and seamless integration with the community. Read this free white paper from Jive Software to learn more.